The soulful songs of the Gullah culture are brought to life by this band of native South Carolinians who mix low country traditions with large doses of jazz, gospel, funk, and rhythm and blues. Quentin Baxter, Kevin Hamilton, Charlton Singleton and Clay Ross came together in 1998 to form a Charleston jazz quartet. 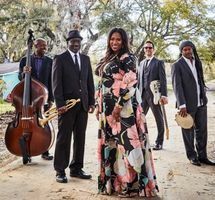 They have reunited, adding celebrated low country vocalist Quiana Parler to revive a “Heartland of American Music” born in their own backyards.